Submitted by Halfling Rogue on December 18, 2007 - 3:41pm. That's the first question I'd ask. Submitted by Komitadjie on December 18, 2007 - 5:16pm. Seems perfectly reasonable to me. 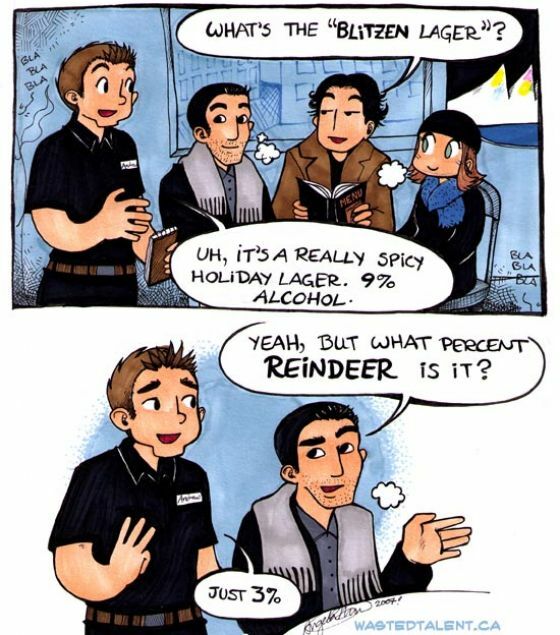 Next thing I'd ask would be what *part* of the reindeer. Then probably order one anyway, just because I could. Submitted by Thief on December 18, 2007 - 6:05pm. Submitted by Maxy_Dawg on December 18, 2007 - 8:29pm. Submitted by JesseT77 on November 7, 2008 - 6:22pm. Submitted by Suilean Dubh on June 6, 2011 - 5:08pm. The first question I'd ask is what percent LIGHTENING it is. Erm, because Blitzen is German for lightening (or flash rather, but it means the same thing). And Donner is German for thunder. Submitted by miasaki666 on June 7, 2011 - 4:48pm. it's my freaking 4rth language, okay? I heart my friends... We were at Steamworks Brewpub, incidentally, a place that I highly recommend!